Tennyson's "Dream of Fair Women"
I purchased this postcard photo some time ago on eBay because it is from the studio of Frederick J. Boyes (of 22 & 24 Osmaston Road, Derby). However, it is also of interest for the reason that it is from a rather different genre from the usual contributions that I receive. 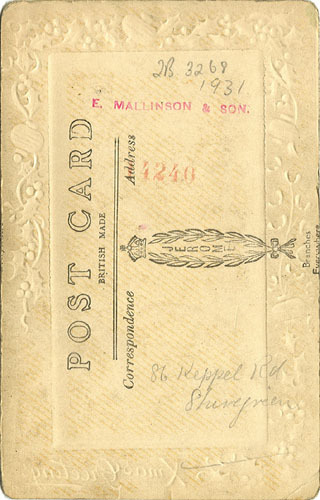 It is a standard postcard format picture. 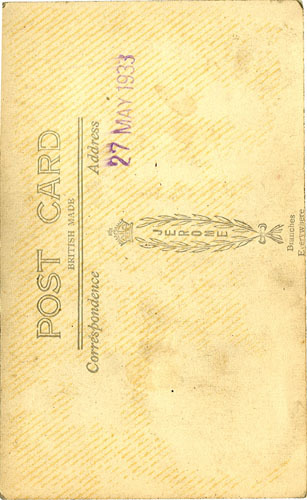 The reverse is of a very ordinary design, with no studio name printed; as was common with Boyes' later postcard portraits, the studio name and details are blind stamped onto the lower right hand corner of the front of the card. 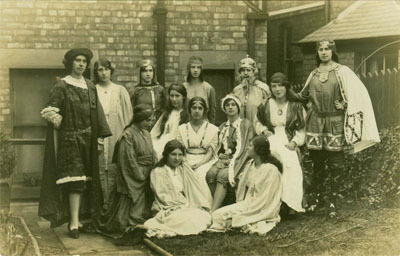 Unfortunately, the identity of the cast members of this performance of "A Dream of Fair Women" has not been preserved along with the photo. As I purchased it on eBay, the provenance is also lost. 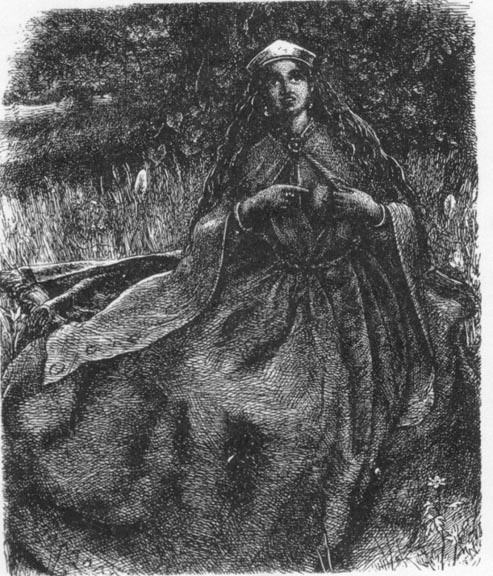 However, there must, somewhere, be records of the poem-play being performed in Derby. I presume it was in Derby, as Boyes was unlikely to have travelled very far afield. It looks as though it has been taken in a suburban garden, but there are few clues as to where. My guess is that it dates from between 1905 and 1925, but it's difficult to be more accurate than that, because the costumes are, after all, costumes. Perhaps there is a reader out there who can offer some more insights into when and where the performance may have taken place, and who the actors were? Alan Radford sent me these three charming hand-coloured postcard format photographs a couple of years ago. The photos are of Alan himself in his youth, and are of a type that was common in the period between the wars. 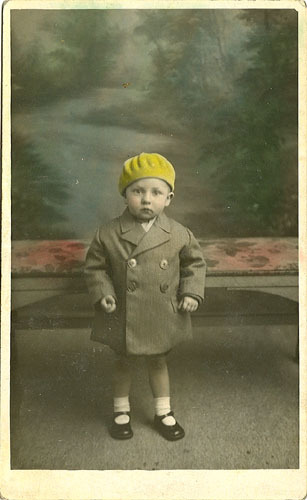 The photos are not from Derbyshire - Alan grew up in Sheffield - but Jerome Studios did have a branch in Derby, which operated from 1929 to 1949. The first of the images has a rather nice embossed frame, and is inscribed "Xmas Greetings" in the lower margin. It also has two numbers, one stamped (14240), the other written (2B 3268) - it is not clear which of these is a negative number - and a stamp, "E. Mallinson & Son". The latter is probably the name of the manager(s) of that branch. The first two postcards have the standard "Jerome crown & wreath divided-back", while the third, and most recent, merely has a simple diagonal "Jerome stamp." These three portraits are nice examples of hand-coloured black-and-white photos. This process of studio artists hand-colouring monochrome photos in this manner was first employed by studios in the 1850s with daguerreotypes and ambrotypes. In the 1860s, 1870s and early 1880s the process was also used for cartes de visite, cabinet cards and photographic portraits printed on other materials such as ceramics, but by the late 1880s and 1890s they appear to have lost favour, and are rarely found. 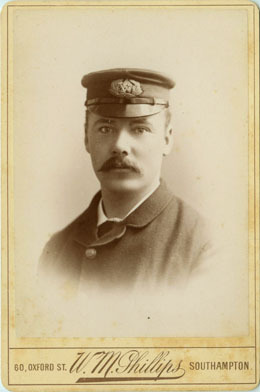 The postard format was introduced for portraits around the turn of the century, but really started to flourish in the early 1900s. 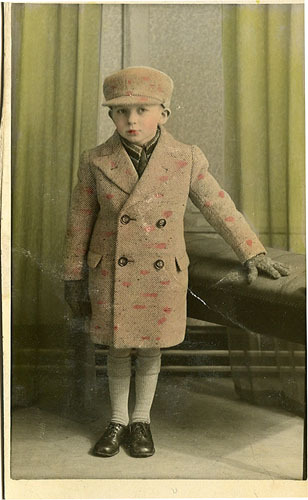 After the First World War colouring of photos became popular once more, particularly for images of children. Jerome's Studios appear to have flourished from after the First World War until at least the early 1970s. They advertised as having branch "studios everywhere," but unfortunately rarely mentioned on the reverse where the studio in question was located. 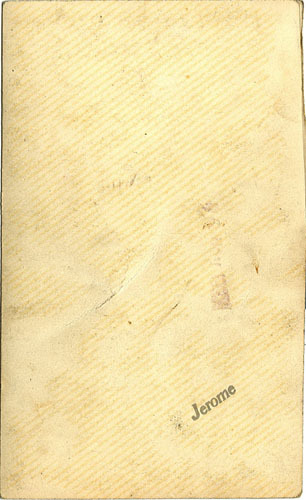 However, one thing which they did commonly include on the reverse was a date stamp, so useful to family historians. 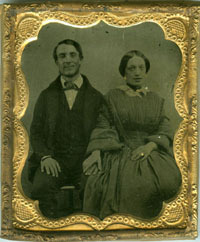 Most of the portraits that I have seen have been postcards, some of which were sold enclosed in card or paper folders. Peter Stubbs has an interesting article about Jerome Limited on his excellent EdinPhoto web site, with several examples of plain black-and-white and hand-coloured portraits from the 1920s and 1930s. Maurice Fisher also has some information about the history of Jerome Studios on his Photographic Memorabilia pages. 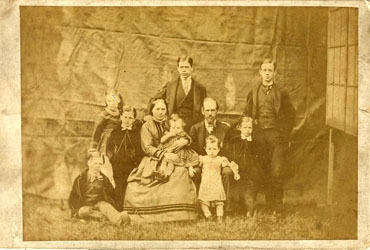 This family portrait is an early landsape format example of the genre, probably taken in the early 1870s. The image is of a carte de visite, unfortunately not inscribed with the name of the photographer, was sent to me by Alan Craxford. 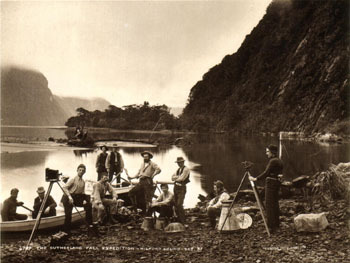 The rudimentary setting of this photograph, with a plain backdrop, and little attention paid to the usual pretense of an artificial studio, suggests that it was almost certainly taken by a travelling photographer. Perhaps he was associated with a travelling show, but he may just as easily have been an itinerant working on his own. Such photographers became common in the 1870s and 1880s, and often serviced the smaller towns and villages in the rural English countryside which didn't have large enough populations to support a resident studio. 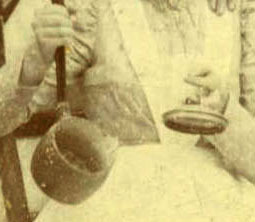 Several aspects of the photo suggest that it may have been a "practice" shot, or at least hurried, as their has been no attempt to hide the fake window seen on a stand at the right of the image. 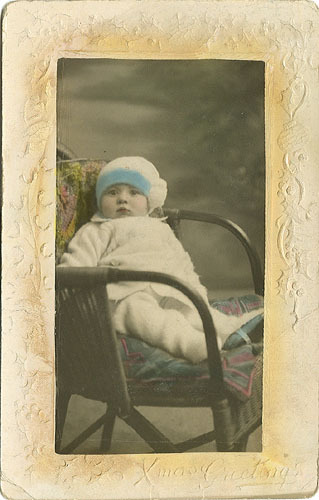 One of the advantages of the outdoor shot, however, was that the enhanced lighting reduced the need for lengthy exposure times, and made it somewhat easier to keep young children still for the duration of the shot. 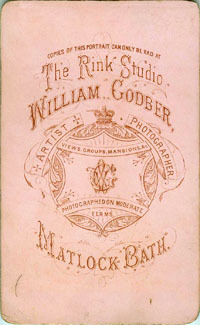 Alfreton was not well served by permanent photographic studios until the 1880s, when Robert Taylor opened for business in nearby Codnor Park. 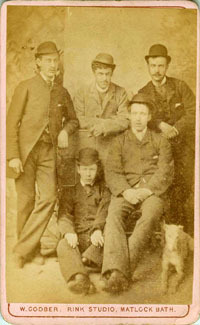 George Edgar worked briefly in the town in 1859 and 1860 as a travelling photographer, but no data is available to show who catered for the portrait photo market in Alfreton in the mid-1870s, when this picture was taken. 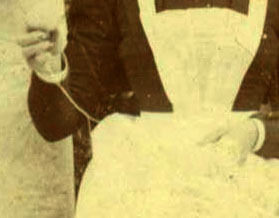 Although the hairstyle of Ann Naylor is reminiscent of the mid- to late 1860s, her clothes suggest a date closer to the mid-1870s. 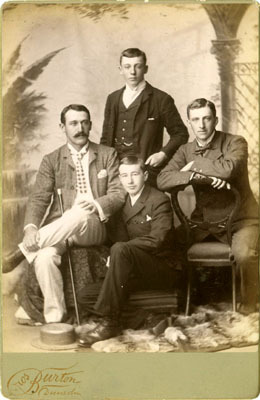 It's far more difficult to date the clothing of men and children with much degree of accuracy, but in general the men and older boys are dressed for this period as well. It's my estimate, therefore, that this photo was taken some time around 1872-1874. This has led to my tentative identifications of the people in the family photo above, together with their approximate ages. 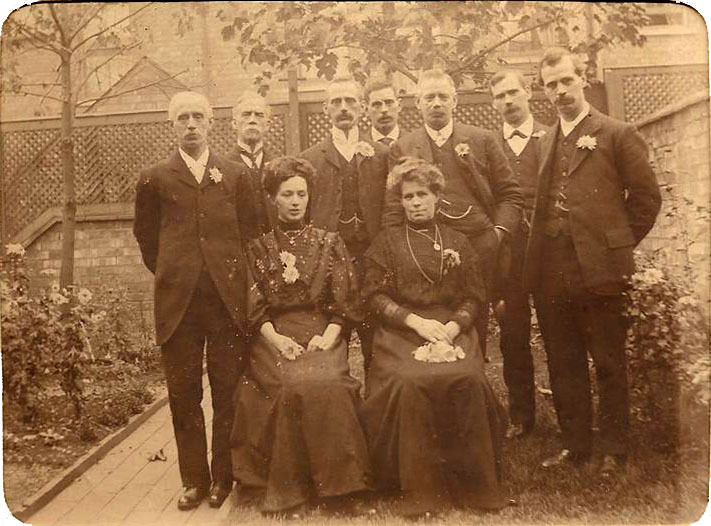 The family of John and Ann Naylor does appear to have been a very tightly knit unit (living in neighbouring houses through the censuses of 1881 and 1891) but after John's death the branches seem to have drifted apart. 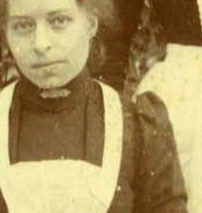 Miriam Naylor was my maternal grandmother and died five days after my mother was born in May 1916. Mum was raised by Miriam's sister, Mary and husband who by that time had two adult sons. We heard talk of Mum's older uncles. Our only link was a (I think quite remarkable) group photograph of the seven brothers and two sisters drawn together sometime around 1900. I do not know where this was taken or what the occasion was. They appear to be "dressed up" with button holes but their expressions are generally quite sombre! I think the family resemblances among the brothers is remarkable! Many thanks to Alan, whose maternal grandmother Miriam's album has provided a wealth of interesting material for his family history research, and some nice pictures for me to feature here. 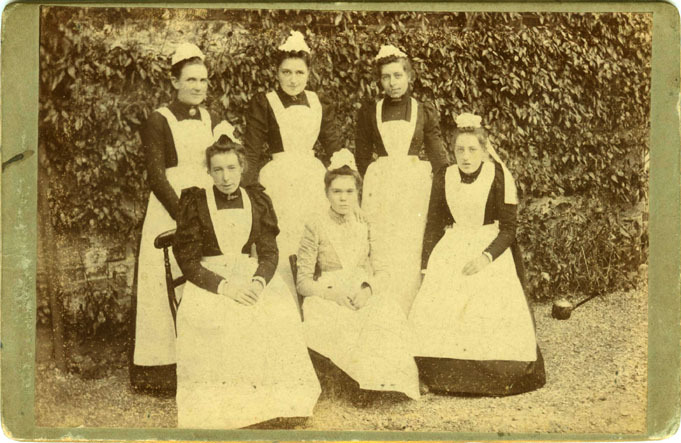 Robin Bishop sent me this copy of a rather nice cabinet card format photograph of a class of Victorian schoolgirls. 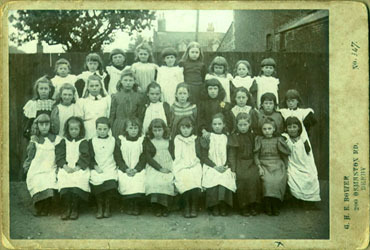 Robin's grandmother Emilie Sewell (1889-), then about eight years old, is seated in the front row, at second from the right; she marked herself with an X on the lower margin of the mount, and inscribed the reverse with, "High Street, Lowestoft, Suffolk, England." Also written on the back is "Cunningham School Class." 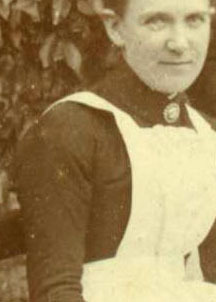 She was born at Norwich in 1889, daughter of Edward Sewell and Emily Martin, but moved to Lowestoft when young, and emigrated to New Zealand with her widowed father in the early 1900s. The photographer George Henry Everard Bower was born in 1869 in Syderstone, Norfolk, son of an Anglican minister. The 1891 Census shows him living with his parents and three sisters in Heigham, near Norwich, and he was then a "Student of Music." Between then and February 1893, when his father died, the whole family moved to the village of Ockbrook, east of Derby. They were living in Ockbrook until at least 1895, when one of George's sisters died. By late 1898, however, when the Kelly's Directory for 1899 was compiled, they had moved to 200 Osmaston Road in Derby. George's mother died in 1899; George and his three remaining sisters, all still unmarried, were living at the same address in April 1901. I have not found any mention of Bower working as a photographer in any of the abovementioned references, and I suspect that it was a temporary occupation of fairly short-lived duration, perhaps to bring in a little more income while he was establishing his reputation as a music teacher. The fact that the address "200 Osmaston Road" is shown on the photograph suggests that it is unlikely to have been taken prior to 1895. Unfortunately, I don't yet know precisely when he left that address. 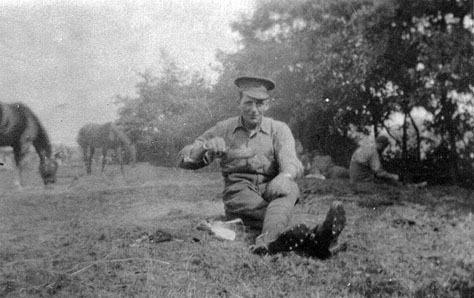 The photograph has a very low negative number (347) marked in pen on the front of the mount, suggesting that Bower was a relative newomer to the field. He was pretty competent, however, as the group portrait is a particularly good one, well posed, sharp, and with a decent tonal range and plenty of contrast. All that it is missing is a notice board with the school name and class number, a common accessory used in school portraits of the period. It is particularly interesting that the photograph appears to have been taken at a school in Lowestoft, because of George Bower's Norfolk connection. Perhaps he returned to the Norfolk coast at some stage to ply his trade. There were many well established photographic studios in Derby at this time, and I think newcomers would have had a tough time trying to break into the field there. 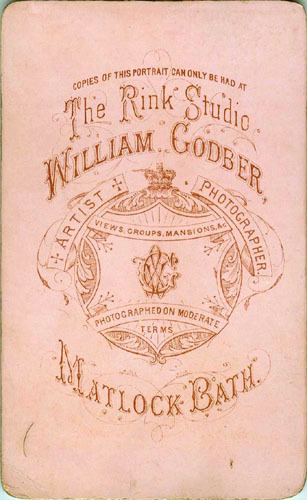 From my research into Derbyshire studios, I have found many photographers who were only in business for short periods in the mid- to late 1890s. Quite a few would either have changed professions or moved on to try other areas, and I suspect this may have been the case with Bower too. This image, much later than any of those presented in this blog thus far, is one taken from my own collection. 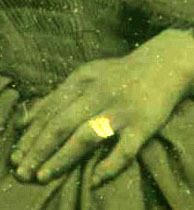 I have included it, as it is an example of how many different aspects, some perhaps not directly related to the photograph itself, may be used to discover more about the incident represented in a photo. It is sometimes astonishing how much can be ascertained. However, I never really knew my grandfather, having grown up thousands of miles away from Derbyshire, where he and my grandmother lived. During my investigations into his life, and more specifically while researching his military service during the First World War, I decided that there must be more to to be found. First, I looked at the style of the photograph - it was a standard print of the times, probably taken with a cheap camera by an amateur. There were therefore no markings such as a studio name to assist further in that direction. "His lordship taking his rum ration - The latter I have removed from my war picture album." Presumably Ed Pye was present at the time the photo was taken, indeed he may have taken the picture himself. The inscription on the reverse of the print suggests that it was taken in August 1915. Certainly Leslie looks much the same as in another photo of him in the family collection (see below). This was taken at the studio of E.M. Treble in Derby, and I believe the sitting was probably during a visit home on leave from the army in June or July of 1915. To investigate further the movements of my grandfather in the spring and summer of 1915, I resorted to his CEF war service records and the war diaries of the unit in which he was serving at the time, the 2nd Divisional Train, Canadian Army Service Corps (CASC). His service records I had previously ordered from the Library & Archives of Canada (LAC), and scanned images of the CEF War Diaries are now available online from the same source. 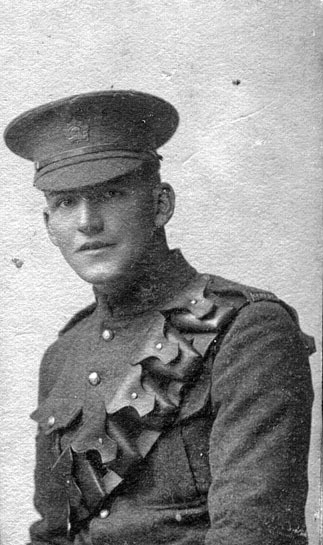 Leslie Payne and his unit spent four and a half months in the south of England training with the Canadian forces prior to their embarkation for France in mid-September 1915. They were based mainly at Dibgate Camp, near Shorncliffe, west of Folkestone in Kent. 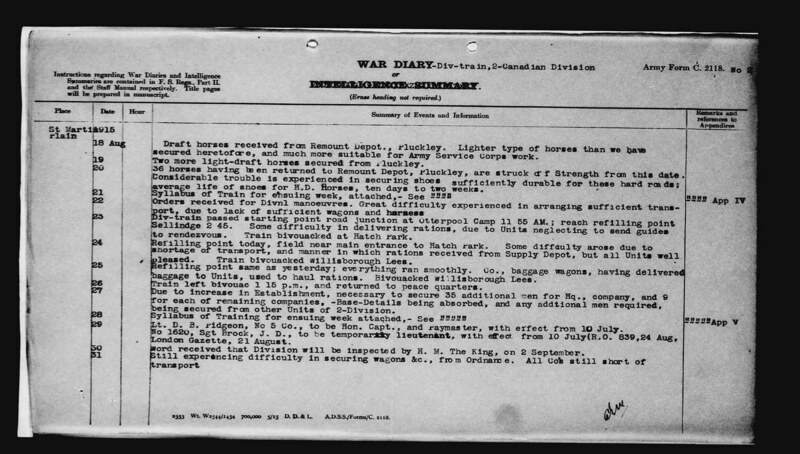 According to the War Diary for August 1915, the entire Canadian Second Division including my grandfather's unit, spent four days from 23rd to 26th August doing "manoeuvres." The entries show that the 2nd Div. Train bivouacked at Willisborough Lees for two nights on the 24th and 25th August. They camped at nearby Hatch Park on the 23rd. It is clear that the inscription "Will... (?sp) Kent, August 1915" is in fact "Willisborough Lees" - or Willesborough Lees as it is spelled on contemporary Ordnance Survey maps. 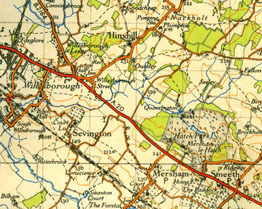 The hamlet of this name is located just to the north-west of the town of Willesborough, near Ashford in Kent (see portion of 1945 one inch to a mile Ordnance Survey map, above). From what I can tell, this is the only occasion that they were near this location, or indeed near anywhere with a name starting "Will.."
While I am unlikely to ever find the exact location of my grandfather's bivouack site in a paddock near Willesborough Lees on the 24th and 25th August, I am confident that the photo was taken there. I will be visiting the Shorncliffe area briefly in October, and may get the opportunity to at least drive through the Willesborough Lees area. It will provide a fitting conclusion to my research into this photo. Old photos were frequently copied long after the original portrait had been taken, often subsequent to the death of the subject, and I have come across many examples in the compilation of my Derbyshire Photographers & Photographic Studios collection. However, sometimes the memory of a departed family member was celebrated in a slightly different fashion. "It has been suggested that the photo was taken of a portrait after his death....of course, it may not be him ... I have tried to make out what the bits and pieces are by blowing up the picture, but it just isn't quite clear enough to decipher the titles of the books etc. - the folded bit of paper looks like a cartoon about the Town Council." 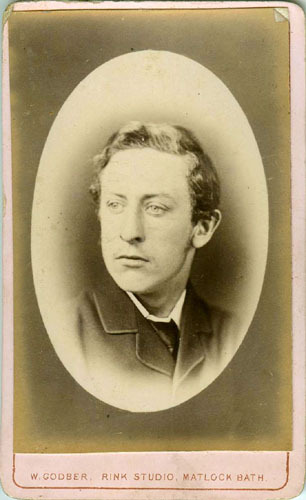 The photographer William S. Sugden died at Brighton in 1880, so this portrait must have been produced before then. 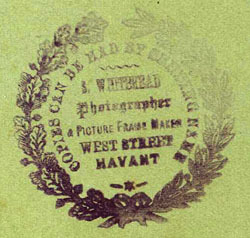 William Sugden was in partnership with Edward Williams at 88 High Street, Exeter briefly between April 1877 and February 1878. 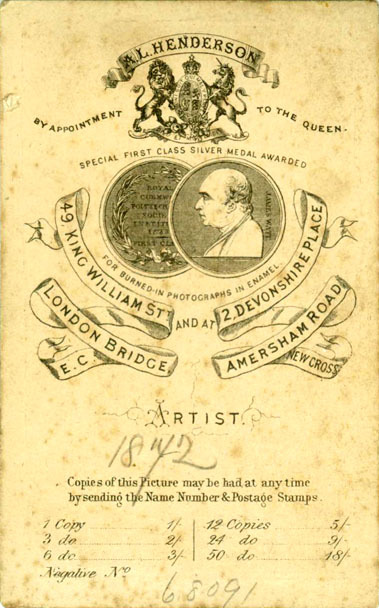 However, in March 1878 the two went their separate ways. Scott (1985) shows them both with premises in March 1878 - Sugden at 88 Queen Street, and Williams at 241 High Street, Exeter - but no later listings in that town. This photo is a rather unusual one, and I believe it must have been taken after the death of the subject. The arrangement of the framed portrait on the writing desk with the books, ink well, quill pen, lamp and loose papers was meant to portray his life and work, and the distinguished person that he was. His clothing looks tailored to me - you don't often see people this well-dressed in photographs from the 1870s. 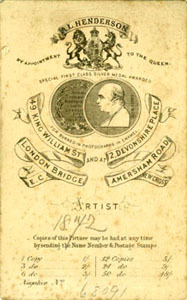 The portrait style, card mount design and known dates for Sugden's studio operation in Exeter, confirms a date of between 1877 and 1880. 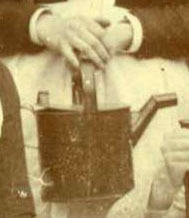 I suspect that it was taken shortly after his death, either in 1877 or 1878. The clothing style suggests to me that the original portrait, which appears to have been enlarged considerably from the size of a standard studio portrait, was taken not long before the presumed subject's death in 1877. All of the items placed on the desk are likely to have had some significance, if only we could work out what it was. 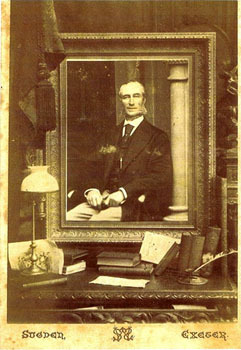 I would be interested to hear from any other viewers who have come across studio portraits such as this one, not just copied from older photos, but incorporating the older photograph, in a separate frame, with carefully selected and arranged accessories to embellish the portrait and give an impression of his importance. This photo, sent to me by Jo Bevan, was among a small collection of photographs possibly acquired in Ashbourne, Derbyshire, and including several early CDVs by photographers (George Edgar, Robert Bull & Louis Twells) in that town. 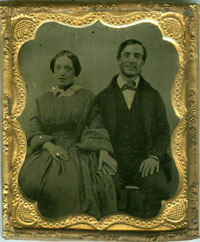 The carte de visite mount is clearly marked, "Copied by Winter Derby" and is similar to others by W.W. Winter taken and/or copied at the Midland Road studio in the late 1870s and early 1880s. 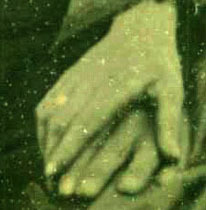 However, the man's clothing, his pose, and the portrait style suggest that the photograph was originally taken much earlier, perhaps in the early to mid-1860s. The inscription on the sack clearly stands for "Gallimore, Ashbourne." Thomas Gallimore (1820-1874) was a maltster, brewer and publican, proprietor of the Old Red Lion Inn in the Market Place, Ashbourne. At the time of the 1861 Census, George Edgar was lodging next door to Gallimore at the Red Lion. 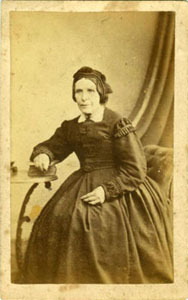 In fact, he was the only photographer working in Ashbourne at this time, and it seems likely that he was the original photographer who took this portrait. 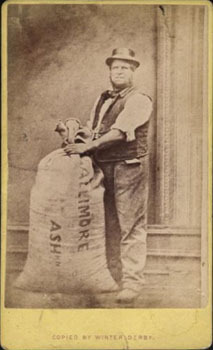 It also seems highly probably that the subject is Thomas Gallimore himself, holding a sack of barley (or perhaps hops), used in the brewing and malting process. This photo is a good example where the studio name is a red herring with respect to finding out where it was taken. In this case, it is fortunate that a knowledge of the provenance of the photo, in conjunction with a detailed examination of the subject and "studio accessories," reveal enough clues to discover not only the original location, but also to provide a likely identity for the subject. It is also a nice illustration of how accessories were often used by portrait artists, as they often styled themselves, to convey an image, in this case of an industrious, down-to-earth middle-aged man, proud of the business that he had built up over some twenty years. If it was indeed taken in the early 1860s, then it would have been quite a novelty for someone of moderate means in this small Derbyshire market town. 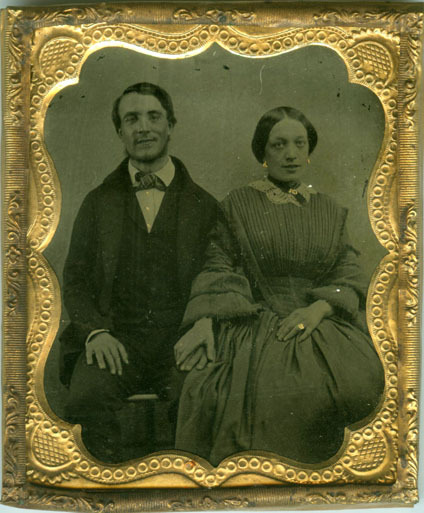 Although photography had already been existence for over two decades, the high price of daguerreotypes and ambrotypes had largely limited their availability to the more wealthy clientele. 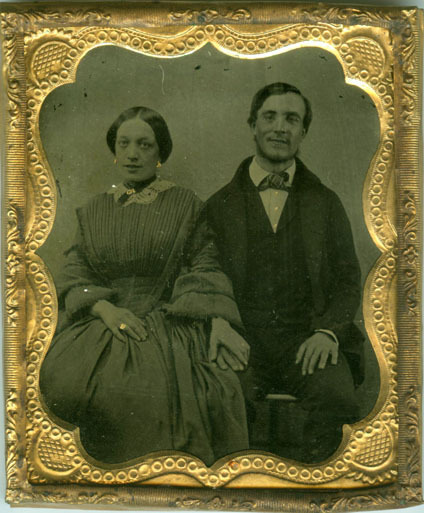 Only with the widespread introduction of the carte de visite in 1860 had it become affordable to a wider proportion of the population. 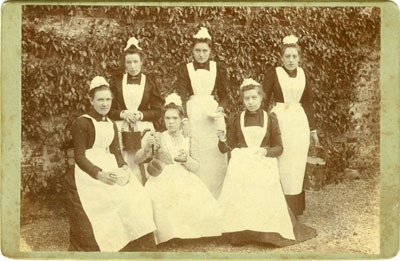 Early pictures of working folk, or at least ordinary people in their working clothes, were fairly uncommon. 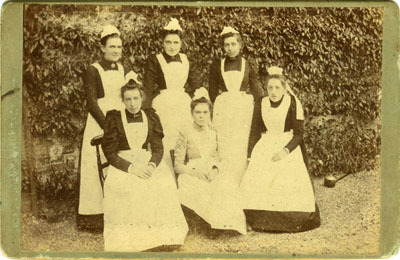 There were some photographers who took a special interest in documenting the lives or workers, but these generally tended to be of domestic staff, mine and factory workers and other employees. Portraits or self-employed people in their working clothes were rather unusual in the 1860s, so this image is particular interesting from that point of view.